I'm going to walk through one example of simulating a dataset with random effects. I'll generate data for a Stroop task where people (subjects) say the colour of colour words (stimuli) shown in each of two versions (congruent and incongruent). Subjects are in one of two conditions (hard and easy). The dependent variable (DV) is reaction time. We expect people to have faster reaction times for congruent stimuli than incongruent stimuli (main effect of version) and to be faster in the easy condition than the hard condition (main effect of condition). We'll look at some different interaction patterns below. We'll use the tidyverse to manipulate data frames and lmerTest (which includes lmer) to run the mixed effects models. I also like to set the scipen and digits options to get rid of scientific notation in lmer output. If you are running repeated simulations (e.g., for a power calculation), make sure you never use set.seed inside of a function that creates random numbers, or the function will always give you the exact same numbers. First, we need to generate a sample of subjects. Each subject will have slightly faster or slower reaction times on average; this is their random intercept (sub_i). We'll model it from a normal distribution with a mean of 0 and SD of 100ms. We also add between-subject variables here. Each subject is in only one condition, so assign half easy and half hard. Set the number of subjects as sub_n at the beginning so you can change this in the future with only one edit. If you already have pilot data, you can estimate a realistic SD for the subjects' random intercepts using the following code. I like to check my simulations at every step with a graph. We expect subjects in hard and easy conditions to have approximately equal intercepts. Now, we generate a sample of stimuli. Each stimulus will have slightly faster or slower reaction times on average; this is their random intercept (stim_i). We'll model it from a normal distribution with a mean of 0 and SD of 50ms (it seems reasonable to expect less variability between words than people for this task). Stimulus version (congruent vs incongruent) is a within-stimulus variable, so we don't need to add it here. If you want to simulate data using the exact stimuli you already have pilot data for, you can calculate their random intercepts using the following code and use that instead of generating a random sample with the same SD. 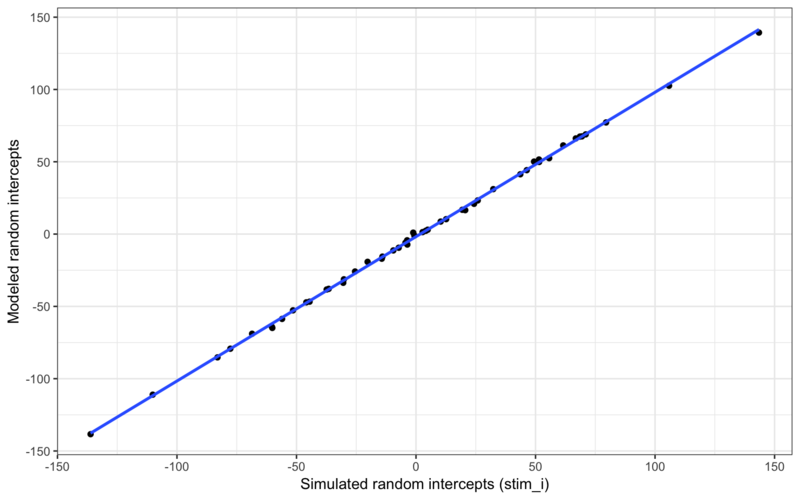 Plot the random intercepts to double-check they look like you expect. Now we put the subjects and stimuli together. In this study, all subjects respond to all stimuli in both upright and inverted versions, but subjects are in only one condition. The function expand.grid gives you a data frame with all possible combinations of the arguments. Add the data specific to each subject and stimulus by left joining the sub and stim data frames. Now we can calculate the DV by adding together an overall intercept (mean RT for all trials), the subject-specific intercept, the stimulus-specific intercept, the effect of subject condition, the interaction between condition and version (set to 0 for this first example), the effect of stimulus version, and an error term. We set these effects in raw units (ms) and effect-code the subject condition and stimulus version. It's usually easiest to interpret if you recode the level that you predict will be larger as +0.5 and the level you predict will be smaller as -0.5. So when we set the effect of subject condition (sub_cond_eff) to 50, that means the average difference between the easy and hard condition is 50ms. Easy is effect-coded as -0.5 and hard is effect-coded as +0.5, which means that trials in the easy condition have -0.5 * 50ms (i.e., -25ms) added to their reaction time, while trials in the hard condition have +0.5 * 50ms (i.e., +25ms) added to their reaction time. We set the error SD fairly low here so that it's easier to see how the parameters we set map onto the analysis output. You can calculate a realistic error SD from pilot data with the code below. The code chunk below effect-codes the condition and version factors (important for the analysis below), generates an error term for each trial, and generates the DV. As always, graph to make sure you've simulated the general pattern you expected. The DV is equal to the grand intercept (400) plus the subject's intercept (-99.6582) plus the stimulus' intercept (-4.4182) plus the effect code for the subject's condition (easy = -0.5) times the effect size for subject condition (50) plus the effect code for stimulus version (congruent = -0.5) times the effect size for stimulus version (50) plus some random error (-8.3181). 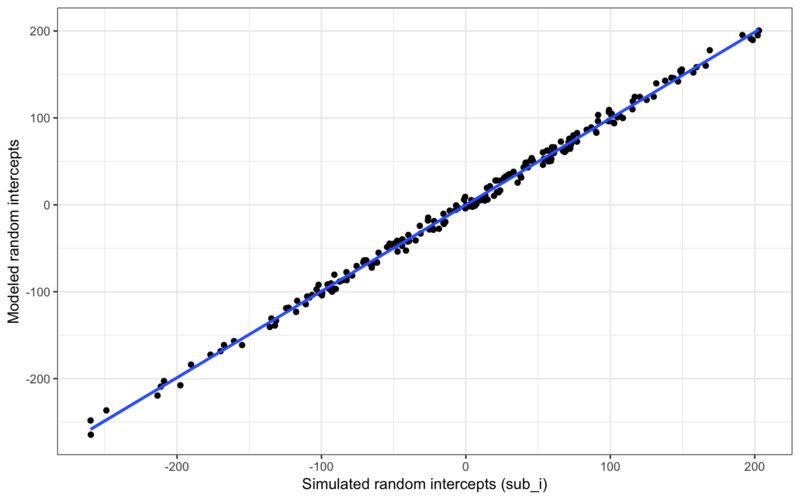 In this simulated dataset, the grand intercept is 401.6, the mean difference between subject conditions is 60.2, and the mean difference between stimulus versions is -49.5. If you want to simulate an interaction, it can be tricky to figure out what to set the main effects and interaction effect to. It can be easier to think about the simple main effects for each cell. Create four new variables and set them to the deviations from the overall mean you'd expect for each condition (so they should add up to 0). Here, we're simulating a small effect of version in the hard condition (50ms difference) and double that effect of version in the easy condition (100ms difference). Use the code below to transform the simple main effects above into main effects and interactions for use in the equations below. Then generate the DV the same way we did above, but also add the interaction effect multiplied by the effect-coded subject condition and stimulus version. Let's look at subject 1's reaction time to stimulus 1 in the congruent condition in more detail again. The DV is equal to the grand intercept (400) plus the subject's intercept (-99.6582) plus the stimulus' intercept (-4.4182) plus the effect code for the subject's condition (easy = -0.5) times the effect size for subject condition (0) plus the effect code for stimulus version (congruent = -0.5) times the effect size for stimulus version(75) plus the effect code for the subject's condition (easy = -0.5) times the effect code for stimulus version (congruent = -0.5) times the effect size for the interaction (50) plus some random error (-31.7369). New we will run a linear mixed effects model with lmer and look at the summary. First, check that your groups make sense (mod.sum$ngrps). The number of obs should be the total number of trials analysed. sub_id should be what we set sub_n to above (200). stim_id should be what we set stim_n to above (50). Next, look at the random effects (mod.sum$varcor). The SD for sub_id should be near the sub_sd of 100. The SD for stim_id should be near the stim_sd off 50. The residual SD should be near the error_sd of 25. Finally, look at the fixed effects (mod.sum$coefficients). The estimate for the Intercept should be near the grand_i of 400. The main effect of sub_cond.e should be near what we calculated for sub_cond_eff (0). The interaction between sub_cond.e:stim_version.e should be near what we calculated for cond_version_ixn (50). 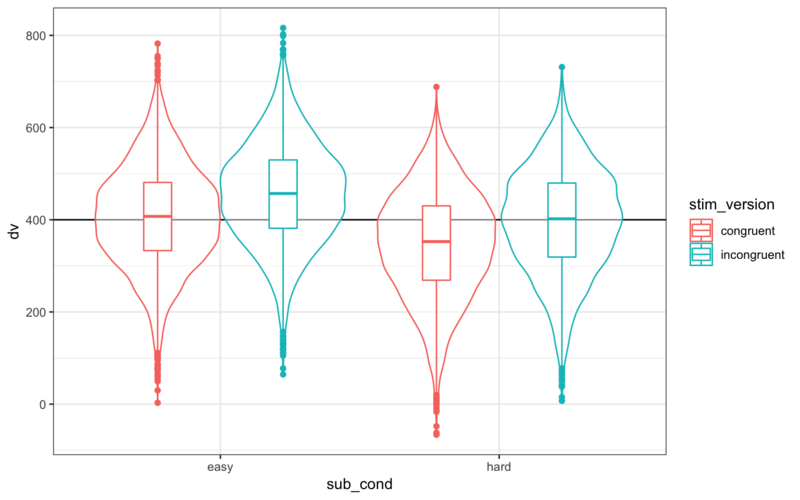 Plot the subject intercepts from our code above (sub$sub_i) against the subject intercepts calculcated by lmer (ranef(mod)$sub_id). Plot the stimulus intercepts from our code above (stim$stim_i) against the stimulus intercepts calculcated by lmer (ranef(mod)$stim_id). You can put the code above in a function so you can run it more easily and change the parameters. I removed the plot and set the argument defaults to the same as the example above, but you can set them to other patterns. Run the function with the default values. Try changing some variables to simulate null effects. In the example so far we've ignored random variation among subjects or stimuli in the size of the fixed effects (i.e., random slopes). First, let's reset the parameters we set above. In addition to generating a random intercept for each subject, now we will also generate a random slope for any within-subject factors. The only within-subject factor in this design is stim_version. The main effect of stim_version is set to 50 above, but different subjects will show variation in the size of this effect. That's what the random slope captures. We'll set sub_version_sd below to the SD of this variation and use this to calculate the random slope (sub_version_slope) for each subject. 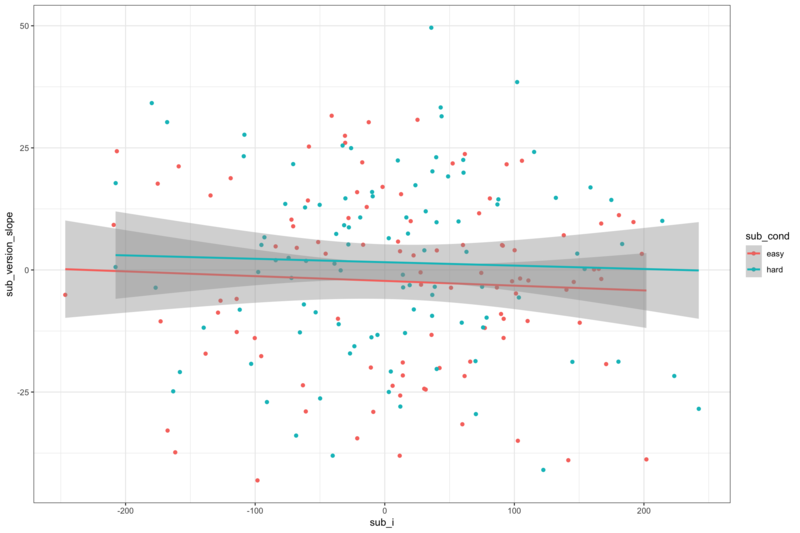 Also, it's likely that the variation between subjects in the size of the effect of version is related in some way to between-subject variation in the intercept. So we want the random intercept and slope to be correlated. 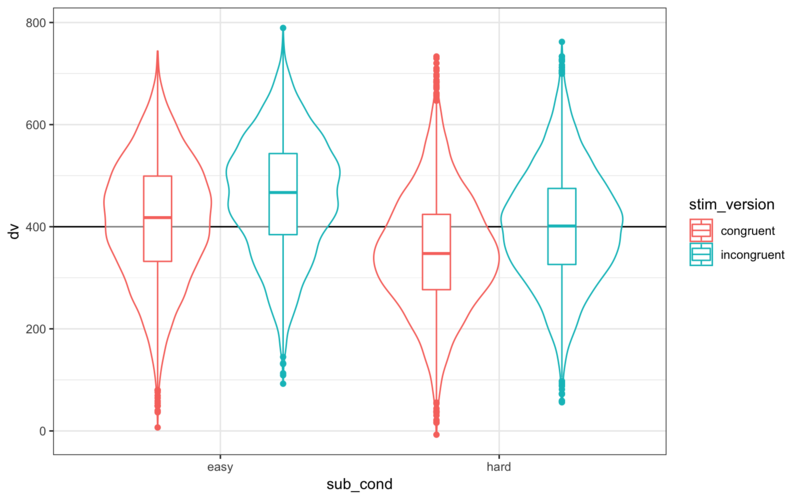 Here, we'll simulate a case where subjects who have slower (larger) reaction times across the board show a smaller effect of condition, so we set sub_i_version_cor below to a negative number (-0.2). I'm writing a package that has functions to easily create correlated variables for simulations. The function rnorm_multi generates n observations of vars variables with mu means and sd standard deviations with cors specific correlations. You can learn more about this function at my Simulating Multiple Vectors tutorial. You can use devtools::install_github("debruine/faux") to install the package. 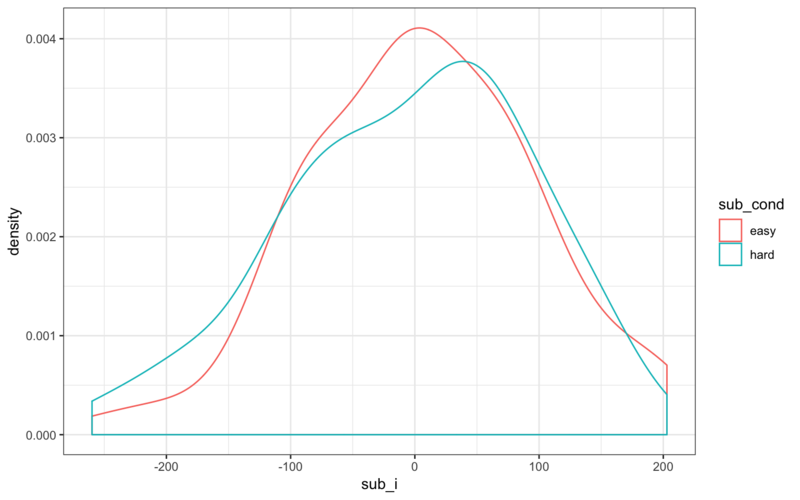 The code below creates two variables (sub_i, sub_version_slope) that are correlated with r = -0.2, means of 0, and SDs equal to what we set sub_sd above and sub_version_sd below. Plot to double-check it looks sensible. In addition to generating a random intercept for each stimulus, we will also generate a random slope for any within-stimulus factors. Both stim_version and sub_condition are within-stimulus factors (i.e., all stimuli are seen in both congruent and incongruent versions and both easy and hard conditions). So the main effects of version and condition (and their interaction) will vary depending on the stimulus. They will also be correlated, but in a more complex way than above. You need to set the correlations for all pairs of slopes and intercept. 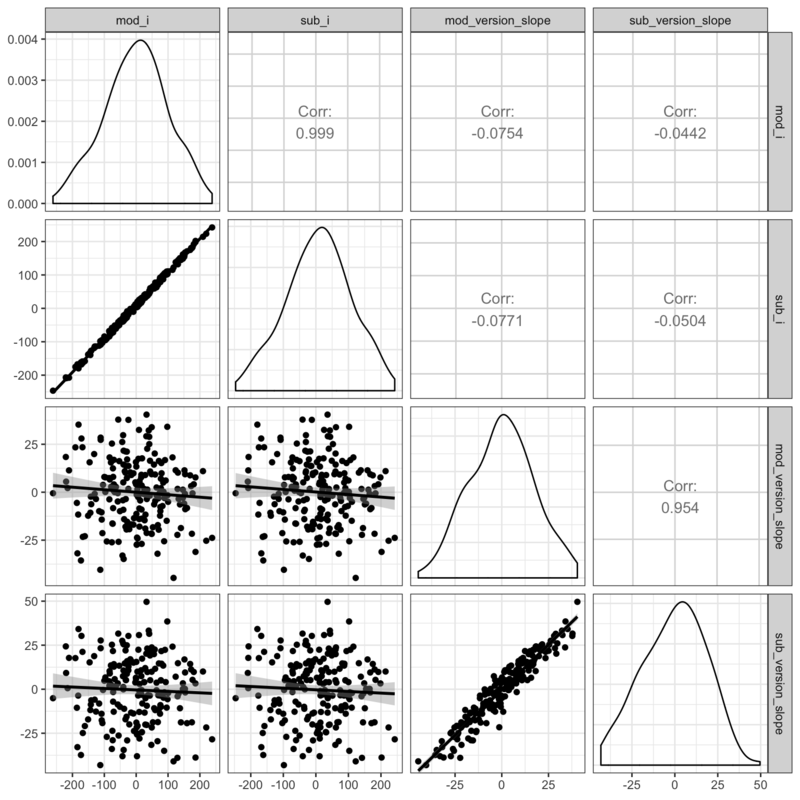 Let's set the correlation between the random intercept and each of the slopes to -0.4 and the slopes all correlate with each other +0.2 (You could set each of the six correlations separately if you want, though). See the Simulating Multiple Vectors tutorial for other ways to set the correlations. Here, we're simulating different SDs for different effects, so our plot should reflect this. The graph below uses the `ggpairs function fromt he GGally package to quickly visualise correlated variables. Now we put the subjects and stimuli together in the same way as before. Now we can calculate the DV by adding together an overall intercept (mean RT for all trials), the subject-specific intercept, the stimulus-specific intercept, the effect of subject condition, the stimulus-specific slope for condition, the effect of stimulus version, the stimulus-specific slope for version, the subject-specific slope for condition, the interaction between condition and version (set to 0 for this example), the stimulus-specific slope for the interaction between condition and version, and an error term. New we'll run a linear mixed effects model with lmer and look at the summary. You specify random slopes by adding the within-level effects to the random intercept specifications. Since the only within-subject factor is version, the random effects specification for subjects is (1 + stim_version.e | sub_id). Since both condition and version are within-stimuli factors, the random effects specification for stimuli is (1 + stim_version.e*sub_cond.e | stim_id). Keep It Maximal is a great paper on how and why to set random slopes maximally like this. This model will take a lot longer to run than one without random slopes specified. Next, look at the SDs for the random effects (mod.sum$varcor). 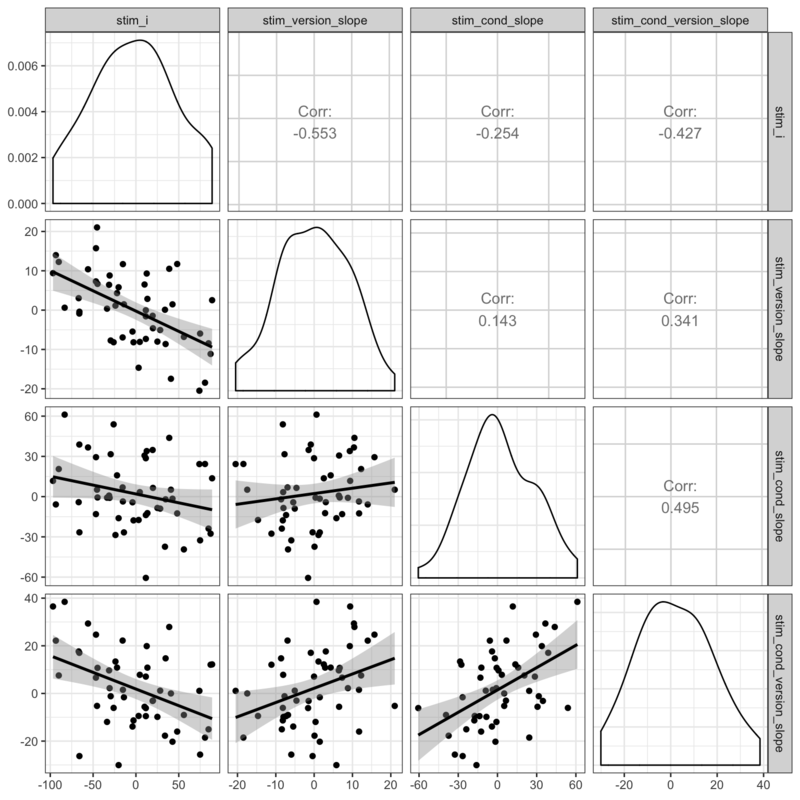 The correlations are a bit more difficult to parse. 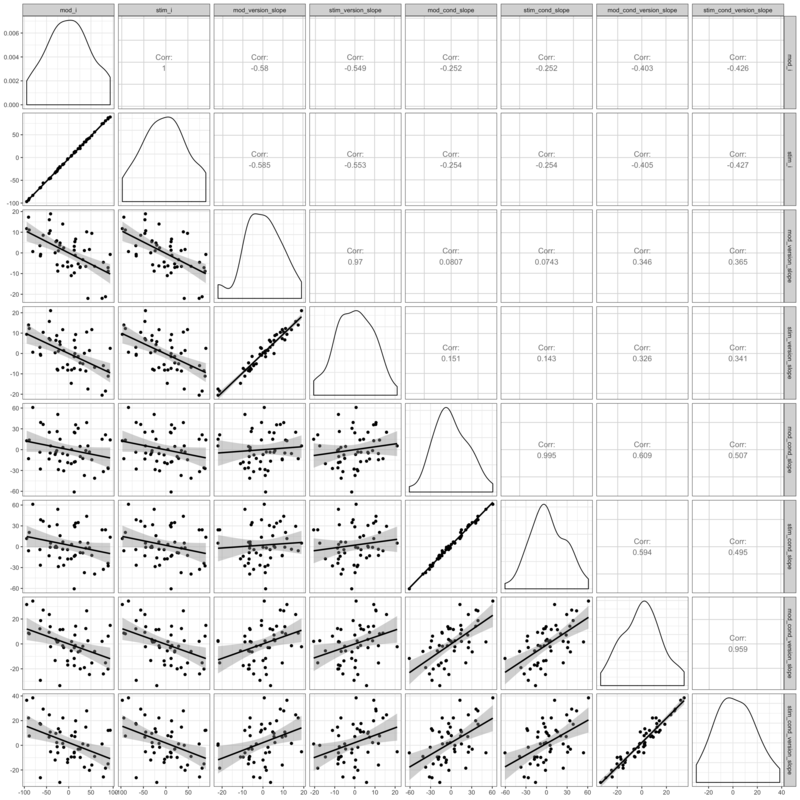 The first column under Corr shows the correlation between the random slope for that row and the random intercept. So for stim_version.e under sub_id, the correlation should be close to sub_i_version_cor (-0.2). 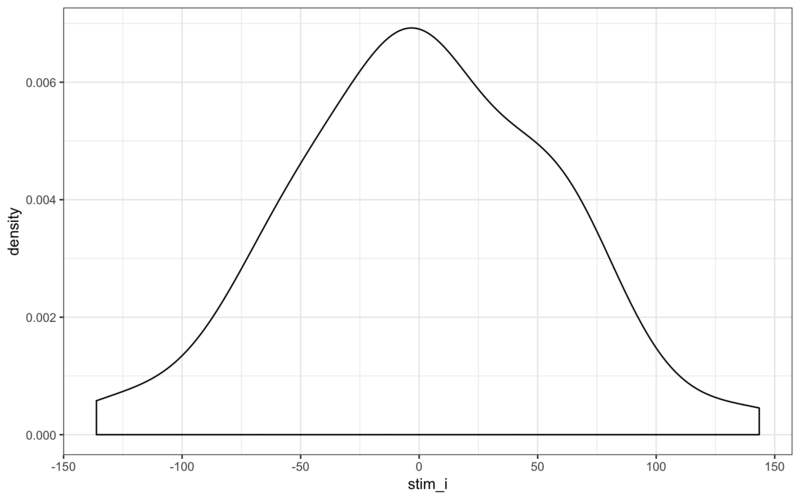 For all three random slopes under stim_id, the correlation with the random intercept should be near stim_i_cor (-0.4) and their correlations with each other should be near stim_s_cor (0.2). 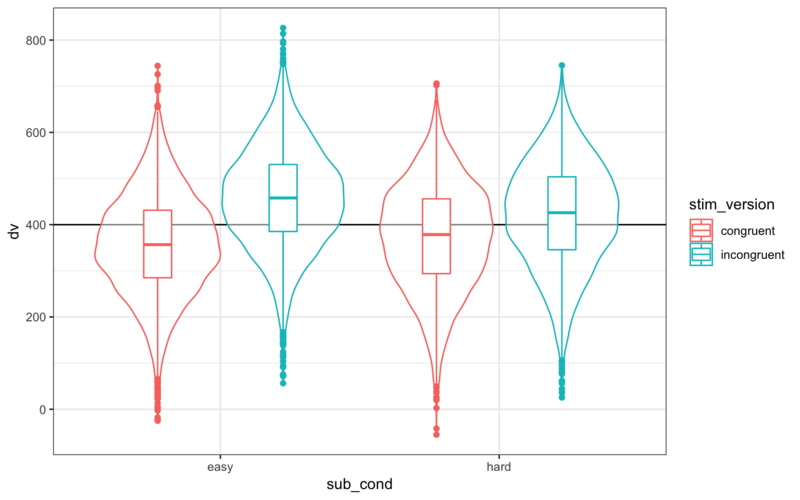 Plot the subject intercepts and slopes from our code above (sub$sub_i) against the subject intercepts and slopes calculcated by lmer (ranef(mod)$sub_id). Plot the stimulus intercepts and slopes from our code above (stim$stim_i) against the stimulus intercepts and slopes calculcated by lmer (ranef(mod)$stim_id).